Reports on consumer apple-purchasing behaviour, by volume and by value, are now available via an online levy-funded dashboard called 'Harvest to Home'. Harvest to Home is an analytics tool, developed by global measurement and data analytics company Nielsen Australia and Hort Innovation, providing insights on market performance and shopper behaviour for a range of industries. Reports can be found on an online dashboard and are freely accessible to all. Reports for apples will be updated generally bi-monthly. Pear reports will be available in 2019, and will be updated quarterly, with the release of new reports publicised via APAL’s Industry Juice newsletter. Reports for the 52 weeks to 6 October 2018 reveal apple dollar sales were flat compared to the previous year, rising just 0.9 per cent. Victoria grew dollar sales the fastest of all the states with an increase of 6.7 per cent. Meanwhile South Australia (including Northern Territory) grew volume sales the most at 4.9 per cent. 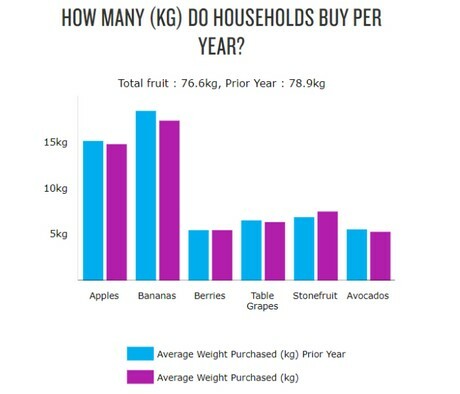 There are also reports on what households buy across half a dozen participating fruit sectors, such as bananas, berries, stone fruit and avocados, detailing how often consumers purchase, how much they spend and how many kilograms of each fruit they buy per household per year. Reports are based on Nielsen Homescan data, collected manually from 10,000 households who record all take-home packed and fresh grocery from all retail outlets. The sample is designed to be demographically and geographically representative of the Australian household population and from this a national projection is made. According to apal.org.au¸ the project has been funded by Hort Innovation, using the apple and pear research and development (R&D) levies, along with R&D levies from other industries and contributions from the Australian Government.